In the last three years, PERSONA, the Research Centre in Phenomenology and Sciences of the Person at Vita Salute San Raffaele University, has invited several scholars working in the field of social facts to discuss their current research. The discussions were held in the lecture halls of the San Raffaele University (Milan), and on this blog, the virtual platform of this research laboratory. The main goal of Phenomenology Lab is to give voice to an authentic phenomenological spirit in both its analytic (in the sense of conceptual clarity and of the attention for formal logic and ontology) and synthetic (in the sense of openness to the best of the philosophical traditions, including the contemporary intellectual debates and the material or regional ontologies). The best contributions on social ontology that preceded and followed the Spring School 2011, and the International Conference Making the Social World, devoted to John R. Searle’s Making the Social World. The Structure of Human Civilization (2010), are collected in this issue of the Journal under the title “Norms, Values, Society: Phenomenological and Ontological Approaches”. 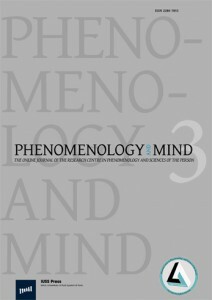 The current issue of Phenomenology and Mind, “Norms, Values, Society: Phenomenological and Ontological Approaches” moves from an hypothesis: social reality is characterized by different levels of life – non-institutional level of life, institutional level of life, ethical-political level of life – each one characterized by its own eidetic laws, but intrinsically linked with the others: we could say, «varieties of normativity» do exist as much as their corresponding «varieties of goodness». Our hope is now to create a platform of discussion on the present issue of Phenomenology and Mind in a special session of our Lab. For this purpose, we are glad to invite authors, reviewers and all of you to post here your comments, questions and remarks on the issue, so that we can continue to foster our scientific discussion.